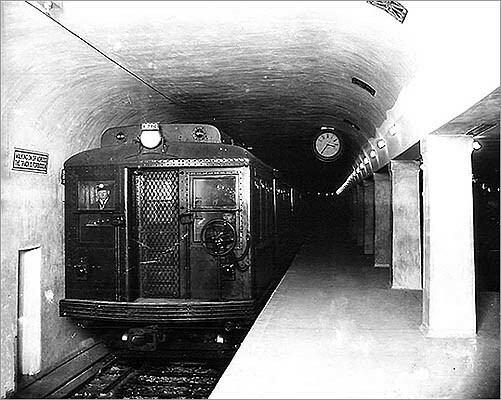 In 1912, the subway lines original moniker did not pack much punch. It was not until 1965, that the Cambridge-Main Street Subway and the Cambridge Connection, which stretched from Park Street to Harvard Square, was assigned a color and a punchier name: the Red Line, in a nod to Harvards crimson. But soon after the launch of that line, which celebrates its 100th anniversary Friday, it was considered a central spine of Boston that brought the citys insular neighborhoods together with unparalleled ease and speed. The Red Line tied two heavy ends together, providing a means for people from very different and disparate parts of the city to get into the city center, said Bradley H. Clarke, president of the Boston Street Railway Association. The Red Line, he said, has had fewer accidents and derailments than any other line on the MBTA, he said. When it comes to rapid transit, he said, the Red Line is a workhorse, not a show horse. At its start, the Red Line also featured the longest and widest cars in the world. Long, straight tracks, rather than winding routes mimicking the labyrinthine streets above, provided unprecendented comfort for passengers. At its opening on March 23, 1912, Bostonians marveled at the trip, which once took 25 minutes in a trolley through Bostons clogged x streets, could now be done in eight. The first train was greeted with cheers from revelers, many of whom waited in line all night to be among the first to purchase tickets for the train. By the end of the day, an estimated 204,000 people had ridden the line. Here a new wrinkle in transportation is given a most complete tryout, the Globe wrote. And then there was that view. Adel Daghmouri, 40, a thoroughly present-day commuter from Cambridge, said Thursday that this stretch from Kendall/MIT to Charles/MGH is a treat during his daily commute. Of course, the Red Line had its challenges. In August 1975, three Red Line trains carrying 1,200 people crashed into each other between Park Street and Charles/MGH, injuring 132 passengers. The epic snowstorm of February 1978 halted service on the above-ground sectors of the Red Line. A couple of days after the storm, Clarke was riding a southbound train from Cambridge to downtown when the iced-over tracks caused the train to slip as it tried to chug over Longfellow Bridge. The driver, undeterred, backed up the train past Kendall/MIT and halfway to Central Station, where he hit the gas and took off like a bat out of hell, skating clean over Longfellow Bridge, Clarke recalled. In 1948, the Red Line was the first line on Bostons subway system to be outfitted with upholstered seats, polka dot curtains, fluorescent lighting and fans for ventilation. The Red Line has always been the most ahead-of-the-curve line on the MBTA, Clarke said, and that will probably continue. Of all the MBTAs tunnels, he said, the Red Line has the most buffer space surrounding trains, giving it the most room for potential experiments with new trains or types of locomotion. Daniel Lampariello, 20, is a cofounder of @Boston_to_a_T, a Twitter account known for re-tweeting passengers rush hour gripes and snarky comments about service. Another Red Line enthusiast, Stuart Stina, 21, plans to celebrate the centennial in style, hosting a party Friday night at Central Square, with a Red Line cake and subway-shaped candies. Were totally going to transit-geek it out, Stina said. But as much as he holds the Red Line dear, his loyalties are fickle: He is already making plans for a summer cookout in Jamaica Plain to celebrate the 111-year anniversary of the Orange Line. Globe correspondent Zachary T. Sampson contributed to this report. Martine Powers can be reached at mpowers@globe.com. Follow her on Twitter @martinepowers. survey Which MBTA line describes your personality? submit What's your craziest Red Line story?